I delivered my latest quilt project tonight to my grandma. 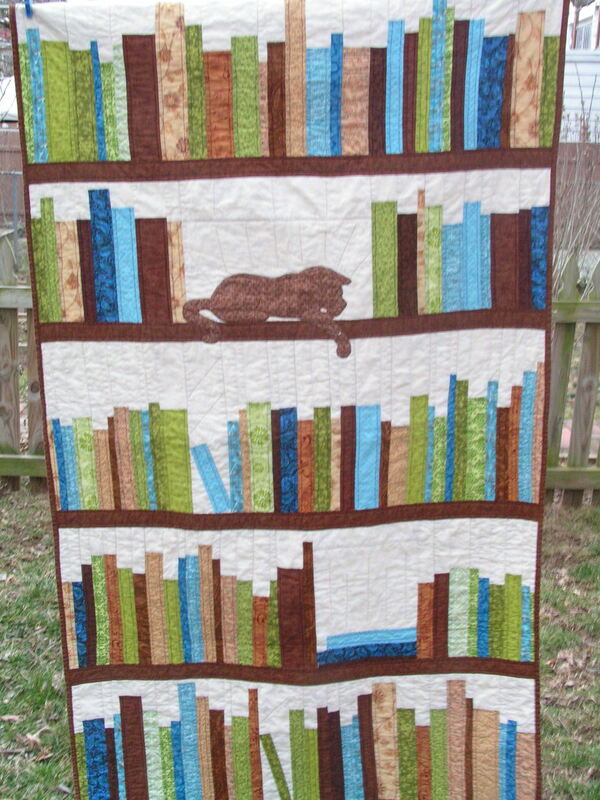 I showed my mom some Pinterest quilts with books on them around Thanksgiving last year, and I told her that I was definitely going to make a quilt like that some day. She said, “Oh, your grandma would love that quilt.” That was about the time that grandma was not feeling well, but we weren’t sure why. I set out to find the pattern, and finally tracked it down in this beautiful quilt book – The Modern Quilt Workshop. My mom gets some credit for me being a voracious reader because despite hating reading she read and read and read to me when I was young. But, my grandma is the one who truly shares and sustains a love of books with me. She would let me sort through her stacks of old Trixie Belden and Bobbsey Twins when I was in elementary school. She patiently listened to many a book plot all the way through with all its minutia carefully recounted by me. And, she’ll still let me go on and on about my used book sale finds. I also learned to love animals by walking my grandma’s dogs around the house. She taught me how to scratch just the right spot on a dog’s chest to make them calm down. And she was on my side for all the years that I begged my parents for a pony. Gathering with the neighbor kids around a box on my grandma’s couch was my first experience of watching the miracle of birth as her cat had kittens. I’ve learned so much in life from my grandma – or at least I’ve seen so many character traits that I aspire to since I’m not as good as her at acting them out yet. But, it’s hard to pictorially represent always believing the best about others or listening to people as if they have the most exciting stories in the world or making everyone feel part of a family. So, I made the quilt represent the tangible marks that my grandma has left on my life. 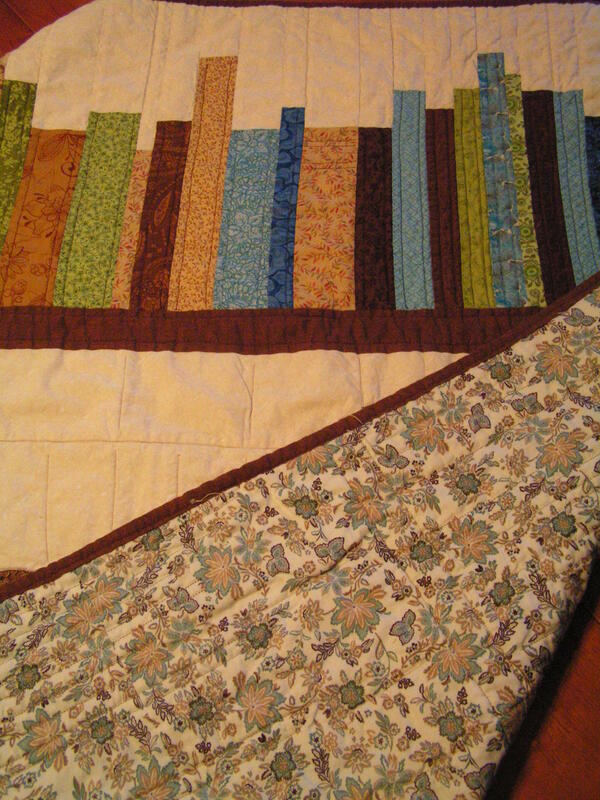 After many nights of measuring, ironing, cutting, and audio book listening, I got the quilt finished. I kept missing the deadlines that I set for myself, so I was determined to get it to her before her third round of chemo, which will be on Tuesday. I got to deliver it to her tonight, and she loved the color and the fact that I added a cat to the shelf. This project was a labor of love well worth it. Now I just need to convince her that it’s ok if it get drops of chicken soup on it or picks up a little dirt by traveling to chemo with her. Quilts are meant to be loved. 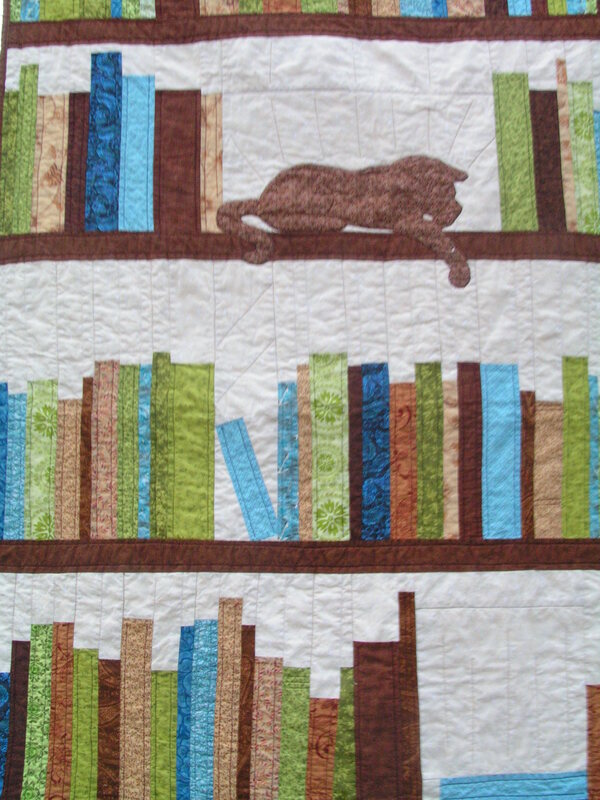 This entry was posted in quilting and tagged grandma, Project 2013, quilt. Bookmark the permalink. ← Wait just a minute…does this look right? A beautiful quilt that deserves to be loved! Wonderful tribute, Jess. I wondered who the recipient would be. How fitting that it will go with your grandma to her chemo treatment. You did a lovely job, and I love the book-theme. Jess, what a fabulous idea! I love the quilt…and even more, I love the tribute to your grandma. She sounds like a fantastic lady. She must be if she had Trixie Belden and the Bobbsey Twins books on hand. (I thought I was the only person I knew who read and enjoyed those books, some of which I acquired from my grandma.) God bless your grandma!